Remarkable versatility, drum lifter transport rotate, lifts and drains fully loaded drums. It carries the full weight. The HD80A Drum lifter raised, transports, rotates, tilts and drains fully loaded drums. It carries the full weight of the drum. Dual, finger trip operated locks secure the raised drum. It can lock a drum in the vertical position to avoid spills or horizontal position for draining through a faucet. When unlocked, the drum may be turned end-over-end to agitate contents or tipped and held manually at any angle, and it is very simple to move and steer. 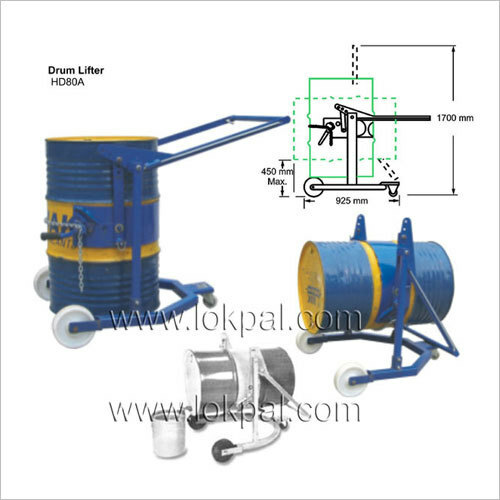 HD80A Drum Lifter uses high strength lifting components. Drum Lifters is secured by high strength, wear resistant chain. The chain tightening ratchet and spring loaded pawl assembly has been designed with specially contoured teeth and safety features for reliability and eases of use. It can be used with standard 210 ltrs M.S.